Below is a list of Iowa golf courses and country clubs that offer weddings services, a banquet hall, etc. The following golf courses can be booked for your wedding. Consider Amana Colonies for a worry-free event experience. We have a Professional staff ready to help you with all the details. We have a range of services and partners to ensure your event is a grand success. Contact us and let us help you get the planning underway! Amana Colonies boasts a beautifully furnished banquet facility with capacity for any group and dramatic views. A Full-Service professional catering staff will pamper you with semi-formal to formal dining packages, and we offer dramatic sunset staging complete with a backdrop of the golf course. 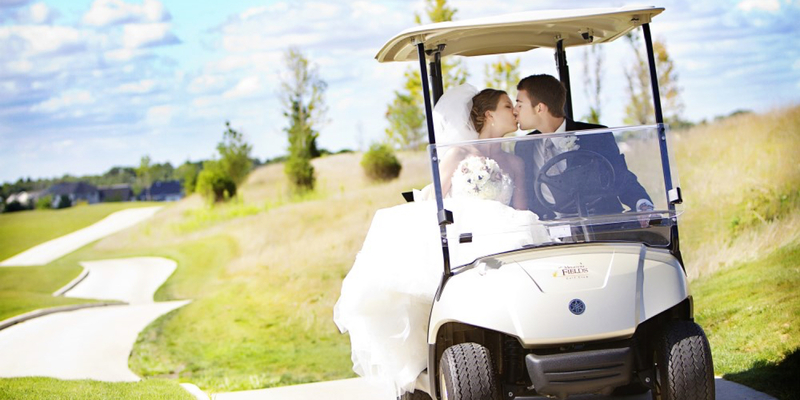 Fox Ridge Golf Club has been host to countless weddings and other special occasions. Located seven miles from Cedar Falls on Highway 20, its beauty and elegance are something to behold. The 8,076 square feet of banquet space must be seen to be appreciated. The stylish and well designed clubhouse is able to seat up to 320 guests and the experienced staff at Fox Ridge will ensure that your event will be a memorable experience. Whatever the event or occasion, our facility will meet your every need: Anniversaries, Baptisms/Communions, Baby/Bridal Showers, Receptions, Birthdays, Business meetings/Off site Business Retreats, Class Reunions, Fundraisers and Holiday Parties. The Resort specializes in wedding receptions with the ability to handle guests from 100 to 500. Each event requires organization and attention to detail. We pride ourselves on being able to provide the attention and service you deserve. Your event can be tailored to most needs and you can rest assured we will do all we can to make your day with us a special one. The Links Restaurant and Lounge is a full-service restaurant that can meet your every need. With a wide selection of entrees and the flexibility to offer buffet or plated dinners, the Links Restaurant will tailor the menu to your unique reception. The Resort also offers the Lake Panorama National Inn and Suites for overnight accommodations. We have a motel complex that has 27 separate rooms and seven two-bedroom townhomes for rent. All units are within walking distance of the Conference Center and work nicely for guests wishing to spend the night with us. A complimentary suite is given to the bride and groom as a small token of appreciation for allowing us to host your reception. At Whispering Creek Golf Club, we specialize in creating one-of-a-kind weddings and special events of all sizes and types that reflect your personal style and create memories to last a lifetime. From small, intimate business dinners and bridal/baby showers to corporate meetings, holiday parties, birthday and anniversary parties, rehearsal dinners, fundraising events, golf tournaments, and other special occasions, we offer a unique facility along with comprehensive event management services, all underscored by our signature personalized service.